Facebook is dipping its toe into the pool of mobile payments, announcing this week that it’s launching a system that will allow users of its mobile Messenger app to send money to friends. Joining the effort to turn our phones into wallets, Facebook says the new free payments feature will be rolling out in the coming months in the United Sates. 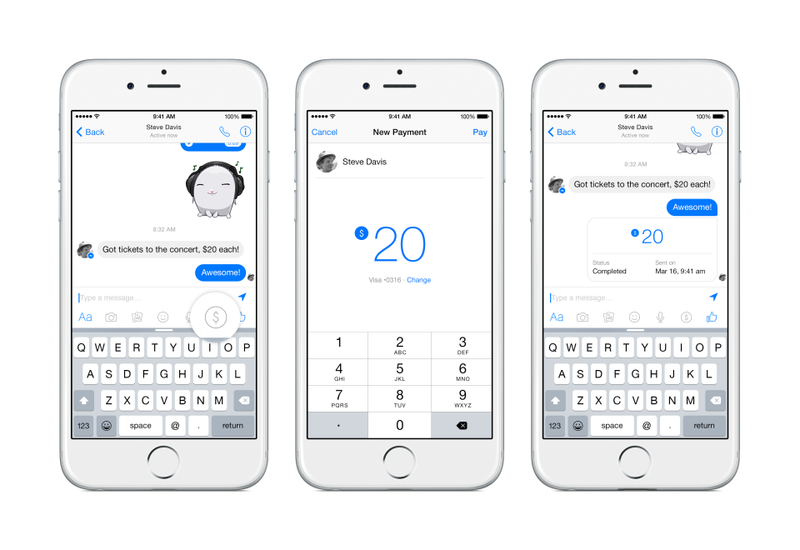 To send money to a friend, users start a conversation in Messenger, then tap a “$” icon to enter the amount they want to send. After tapping “Pay,” first-time users of the payments feature will be prompted to add a debit card for the initial payment, and will then have the option to assign a PIN for an extra layer of security. Receiving money works much the same way — you’ll simply have to accept the payment after adding a debit card to accept funds from your friends. Money is transferred right away, Facebook notes, but much like other payment systems, it could take a few days for the funds to appear in your account, depending on your bank. For those worried about the myriad security dangers out there that come with using mobile payments, Facebook says in the announcement that as a payments processor for gamers and advertisers since 2007, it has processed more than one million transaction a day on the site, which is Facebook’s way of saying it knows what it’s doing, it seems. The company says it uses layers of software and hardware protection to keep payment systems in a secured environment, with an anti-fraud team monitoring the system for suspicious activity. The optional PIN can be used as an extra layer of security, Facebook notes, as well as Touch ID on iOS devices and the option of two-factor authentication available to all Facebook users. Previous When Is Taking A Yellow Cab Cheaper Than Using Uber?